It's back to school season which means it's time once again to see faces new and old in the hallways, in the classroom, and around campus. You may be wondering how to present yourself to your peers through clothing; pieces of fabric woven into different styles, silhouettes, and sizes. Will you try new trends? Get a whole new wardrobe? Raid your sibling's closet? Pop some tags? Whatever your fashion acquisition method, I bet you want to look "cool." 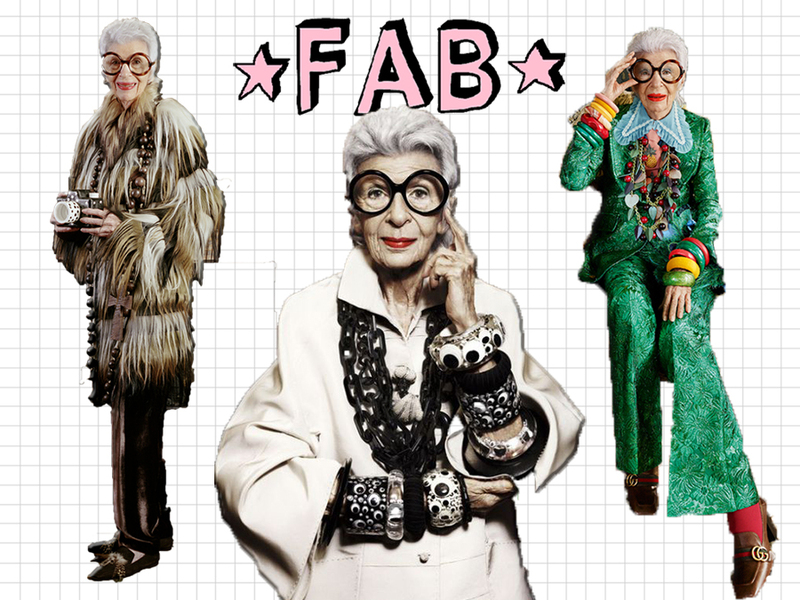 If you're striving for your style to have the "cool factor," look no further than Iris Apfel. Dress like Iris. No, I don't mean this literally, (but if you want to, go right ahead, she's a very stylish lady). What I mean is WEAR WHATEVER THE HECK YOU WANT!!! "When you don't dress like everyone else, you don't have to think like everyone else" - Iris Apfel. "If you make a mistake in what you put together, the fashion police are not going to haul you into jail" - Iris Apfel. "There's no how-to road map to style. It's about self-expression and, above all, attitude" - Iris Apfel. "I don't dress to be stared at. I dress for myself" - Iris Apfel. "It's better to be happy than well-dressed" - Iris Apfel. Iris clearly follows her own clothing compass. Her whimsical outlook on life and style is what makes this fashion icon one of my greatest inspirations. She dares to wear the most eclectic combination of pieces, from oversized jewelry to funky patterns and exaggerated silhouettes. Iris wears what speaks to her and owns the look, which is something we should all do. It doesn't matter what other people think. Being yourself is what's important. Confidence is always chic.